When you’re ready to package and share your Farming Simulator mod with the world, there are a few steps you will need to take. The following information should get you started. When packaging your mod, do a final export from GIANTS Editor into a new folder somewhere else on your hard drive. Doing so can ensure that all of the files required for your mod are in the same place. Doing so is also a quick way to clear out any unnecessary files that may have crept their way into your mod folder. For example, some programs like to leave file litter, which is usually backups of your previously saved version of that file. Blender does this with its .blend1 files, and some text editor programs leave .bak files that serve the same purpose. Exporting leaves those files behind because a player won’t need them to run your mod in the game. Choose File→Export All with Files. In the file browser dialog, navigate to the place on your hard drive where you want to export. Make a new folder for your mod and its files. Depending on your OS, there should be a button in the file browser dialog for making new folders. You also can create a new folder using the right-click menu in the file area. Type a name for your I3D file. Using the same name you’ve been using for it is okay. Repeat the first four steps for each I3D file in your mod. After you finish exporting, you may want to double-check your newly exported mod to make sure everything is properly in order and nothing was lost in the process. If something is missing, simply copy it over from the original mod folder. With your mod neatly exported to a fresh new folder, you can package it for sharing with the wider world. From Windows Explorer, go to your export folder and select all files. Right-click and choose Send to→Compressed (zipped) folder. When it’s done, you should see a new file sharing the same name as your folder. The only difference is that its icon has a zipper on it. That’s your Zip file. Rename your Zip file to something you like, or you can choose to keep the name as-is and just press Enter on your keyboard. 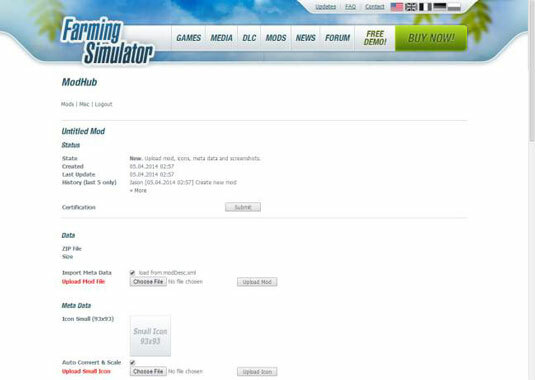 Dozens of sites on the Internet exist with the exclusive purpose of hosting mods for Farming Simulator. Each one has its own mechanism for uploading and approving mods. 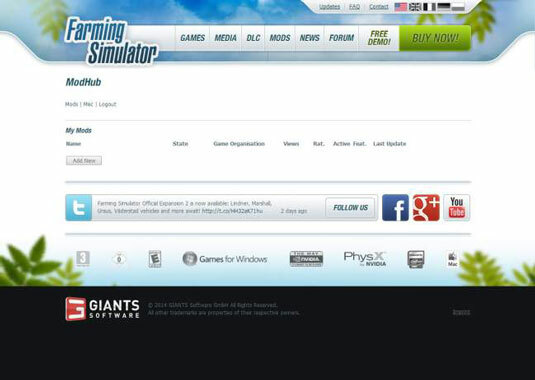 Here, you’re looking at the official ModHub on the Farming Simulator website. Until recently, the official ModHub was open to submissions by invite only. However, ModHub now accepts submissions from everyone. You just need to set up an account. Click on the Misc link in ModHub for a guidelines PDF document (in both English and German). Among other things, it gives you a series of short tests you can do on your mod to make sure it’s properly formatted and error free. Click the Add New button on the main ModHub landing page. You should see that a new mod has been added, named Untitled Mod. This is the placeholder for your mod. Mods don’t show up in the publicly viewable list of mods until they’re approved. And in order to get approved, you need to upload your mod and provide some details about it. Your mod, packed in a Zip file: You have the option here to use the modDesc.xml in your Zip file to fill your mod’s meta data, or the information about your mod, such as the name, author, and description. Keep this checkbox enabled and many of the other fields of this page should automatically populate. Mod icons: ModHub gives you the ability to upload two different sizes of icons for listing on the site. You can just upload the store icon you created for your mod for both, and the site will automatically scale it to fit. Localized title and description: If you chose to load meta data from your modDesc.xml, these fields should already be filled in. Otherwise, you can fill them in manually. Categories: Categories aren’t part of the modDesc.xml, so you need to make some decisions here. You can add your mod into up to three different categories. Make sure the categories you choose are appropriate in order to help people find your mod. Screenshot: This is typically an image of your mod taken from within Farming Simulator. The preferred size for this image is 560×350 pixels. Fortunately, the ModHub uploader automatically scales your image for you if you want. Make sure all of the fields are properly filled in, and you’re good to go. Submit your mod for certification by clicking the Submit button at the top of your mod’s ModHub detail page and waiting for it to be approved. The approval process may take a day or two. You’ve created a mod and you’re releasing it to the world. This mod is your responsibility. Players expect that if they run into a problem with your mod or if they have a question about it, you can fix the problem or try to answer the question.